My oldest daughter and her husband were out for dinner at a fancy restaurant the other night, where my daughter’s husband ordered a Prawn-Cocktail for entree. 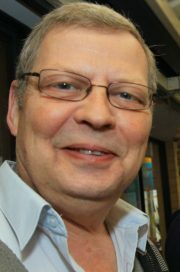 He complained to my daughter, that he was very disappointed with his meal and my daughter started to brag about her father’s Cocktails, the next thing I know, my wife has called the whole family and a couple of friends together for a dinner party the following Saturday and I am told to make the entree. You guessed it Prawn-Cocktails. So I will share the recipe with you. 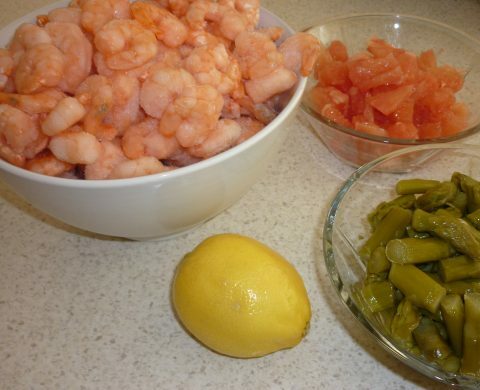 I prefer to use the small Prawns for the cocktail, and usually get them cooked and frozen, that is the easiest way. Peel the Grapefruit and cut into small pieces about 1 x 1 cm. Whip the cream, mix the mayonnaise and cream together and add Lemon juice, Salt, Pepper and Paprika to taste. 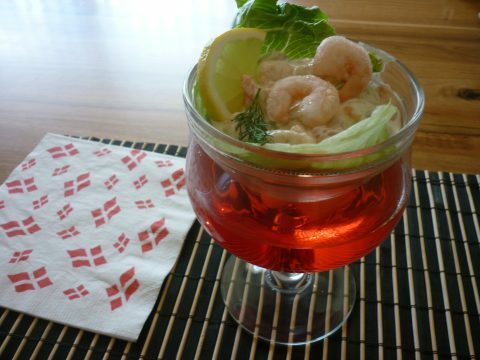 Use a Prawn Cocktail glass or Red Wine glass for serving. 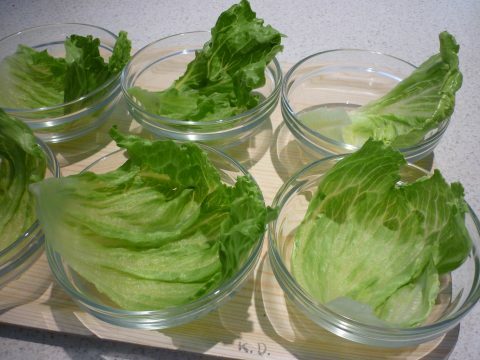 Rinse and dry the lettuce and place a leaf in each lettuce glass. Divide the prawn mixture into the glasses. 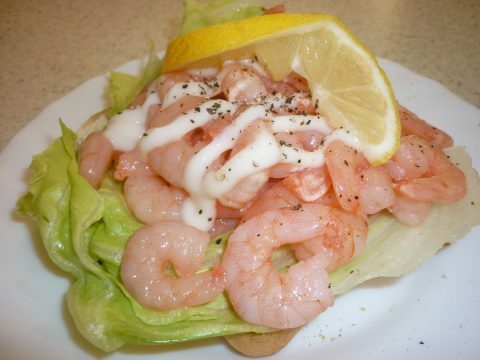 Decorate with ½ a slice of lemon and a couple of prawns. Another idea for an entree using prawns. Toast with prawns is commonly used at a midnight snack on New Year’s Eve in Denmark, it’s easy to make and tastes delicious. Toast with Prawns. A Danish midnight snack. Toast a slice of white bread or use a crusty Vienna or French stick. Butter the bread and place a leaf of lettuce on top of the butter. Cover the toast with plenty of prawns. Decorate with mayonnaise and a slice or wedges of lemon, add salt, paprika and pepper to taste. Leave Prawn Cocktail And Go To Home Page.